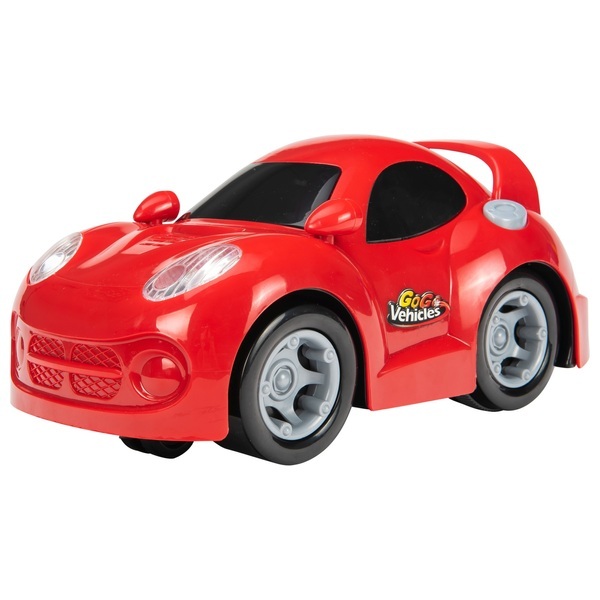 Little ones will love taking control of the Big Steps Vroom My First Sports Car. This radio controlled car can whizz forward, reverse, and turn left or right. Playfully designed to look like a steering wheel, the controls are colourful and clear, perfect for kids new to RC fun. Directional controls are clearly marked by straight or turning arrows. The green button that beeps the horn is at the centre of the wheel, just like in a real car. The Big Steps Vroom My First Sports Car even has bright headlights little drivers can turn on and off using the controller. Easy to use controls, bright colours and a rounded design make this car a great choice for imaginative and creative play, sensory development and fine-tuning motor skills. The connection toy vehicles create between real life and play is what makes them such timeless toys. With Big Steps Vroom My First Sports Car, kids can bring the world around them into imaginative play. In toy vehicles, sorytelling meets physics. Children can get creative with how they move this car to bring their stories to life. Bright colours stimulate a child’s vision, while playing with moving vehicles develops spatial awareness and an understanding of cause and effect. Learn how you move and learn how objects move! Playing with vehicles encourages steering and following, enhancing gross and fine motor skills.